S.I.A. is an optional Module for SoundAr to keep track of your iOS Devices Battery State and get Notifications about special Battery related Events like low battery, charging or fully charged. There is no need to install any additional Apps on your iOS Device, all you have to do is to plug your iOS Device to your Mac and S.I.A. will monitor it. 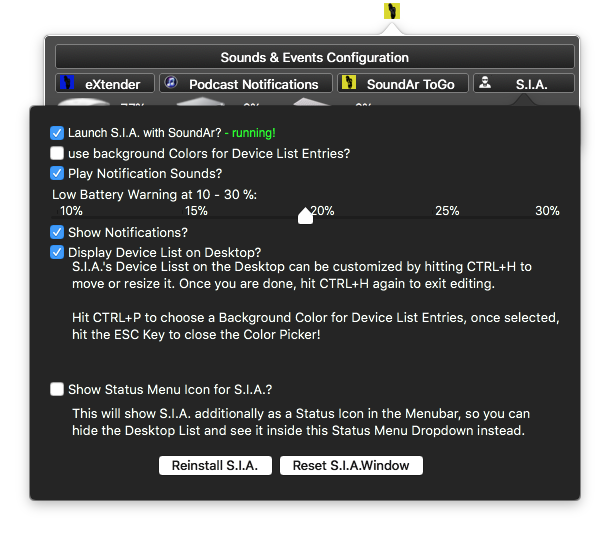 And even better, if you have WiFi Sync enabled with your Mac’s iTunes, you can keep S.I.A. track your Device over WiFi with the need to keep it connected. As a kind of Desktop Widget (mainly designed for this purpose), in this case you will see S.I.A. always as part of your Desktop’s Wallpaper, you can customise the Size and Position and always see what’s going on with the need to click any Menus or Buttons e.g. NEW is S.I.A. S.I.A. now hooks into Powertracker Mobile to live update your Device Stats if enabled! 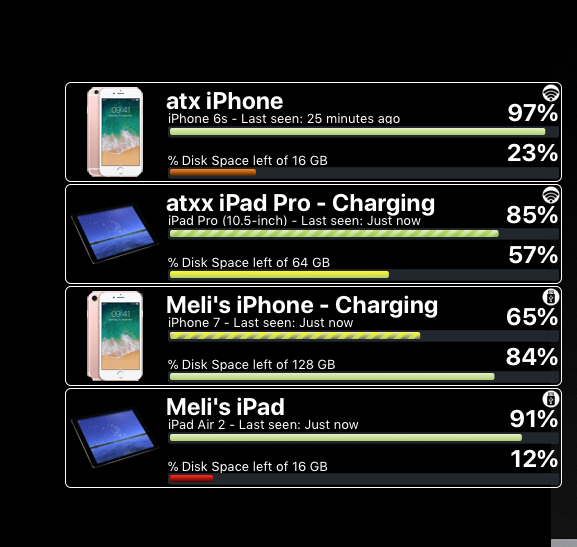 Each iOS Device advertises its Stats into the connected Network continuously, and if you know how to ask, you can ask for these, each MacOS Version knows how to ask, e.g. iTunes itself does this all the time. But due Power Management on iOS this relies on iOS itself to do periodic checks, sometimes it works, sometimes it is delayed, that's where S.I.A. hooks in, S.I.A. does a permanent check and once it discovers a change, it will update your Powertracker Mobile Device List, The only requirement is to be signed into the same iCloud Account on all Devices, enable this Feature in SoundAr's S.I.A. settings and you get nearly live updates of device Battery stats. S.I.A. runs as a backgrounded Agent and has no direct UI where you could enter Settings, that’s why you need SoundAr, it controls all the Settings S.I.A. has to offer. To edit S.I.A.’s Desktop Hud Window, hit CTRL + H to raise the Window and move it or resize it to fit your needs. - launch S.I.A. with SoundAr launch? SoundAr will also automatically terminate S.I.A. if you quit the App. - by default, if you use the Desktop Hud Mode, S.I.A. will make transparent List entries for each Device, but you can tell S.I.A. to use background colours if you prefer, to choose a background color, table this Option, than hit CTRL + P to pick a Colour, once done hit the ESC Key to exit the Picker. whenever an Event occurs, shall S.I.A. play a Sound? Shall S.I.A. 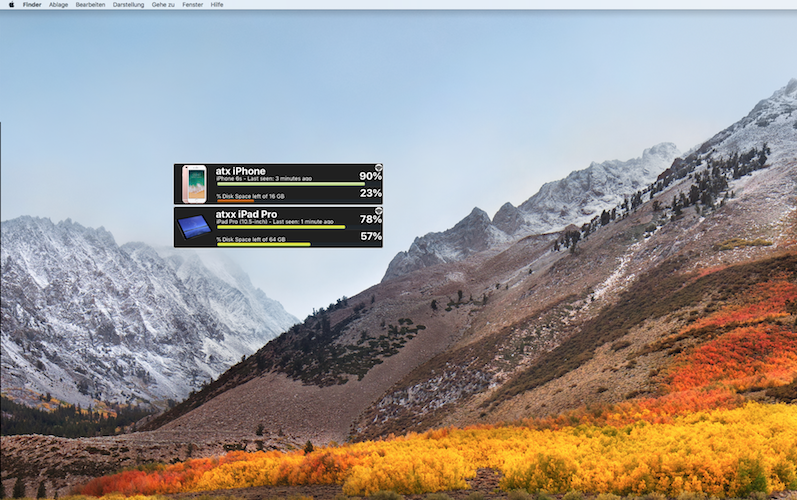 display MacOS native Notifications? As mentioned above, S.I.A. is attached to SoundAr and runs only if SoundA is run-ing and will quit if SoundAr isn’t. Why a Module and not built into SoundAr itself? If your Device does not appear, try to connect it once via USB, check if it appears than, basically you can say, if you open iTunes and see your Device there, S.I.A. showld see it too, if iTunes doesn’t see it so cannot S.I.A. Why does the Percentage not update live and immediately? That’s how iOS Devices work, they announce themselves on Battery Changes, S.I.A.is just listening, so it sometimes take a moment so S.I.A.recevies the update about a Device that it was e.g. plugged in or plugged via WiFi. How do i nage the Text Color if I use tracnsparent Entries?